How New Zealanders choose to decorate their homes can reveal a lot about who they are as individuals and what their country’s culture is like. Décor and furnishing styles have been influenced by New Zealand’s colonial past, and also by Māori and Pacific traditions. How people decorate their homes can show who they are, their taste, values, interests and social class. Home décor trends change over time, often in keeping with architectural styles, and also reflect social and technological change. Whalers and sealers were the first Europeans to live in New Zealand. They lived in one-room huts that were built like Māori whare but contained European-style furniture such as bunks and tables, and sometimes stools made out of whale vertebrae. Missionaries arrived from 1814. They built cottages with several rooms, and with separate bedrooms, reflecting their belief that parents should sleep separately from children. The cottages had wooden floors and simple furniture, generally imported from Australia. Only a few Māori, mainly chiefs, adopted European-style houses and furnishings in this era. Settlers, mainly from Britain, arrived from the 1840s. At first they lived in temporary housing such as raupō (bulrush) huts, and then built more permanent houses. Fireplaces were used for cooking and heating, but houses were cold. Settlers tried to make them pleasant and cosy with furnishings such as curtains, cushions and furniture they had brought from Britain. Other furniture was homemade. In this period a settled family life was encouraged by society, and cosy homes presided over by a woman were the ideal. Middle-class homes became larger and particular attention was paid to decorating the ‘public’ areas of the house – the rooms where guests were entertained. Furniture and interior fittings, such as decorative fireplaces, began to be manufactured in New Zealand. Elaborately patterned wallpaper, wood panelling and decorative ceilings were popular. arts and crafts, which promoted handcrafted simplicity. Bungalows featured simple, efficient layouts and formal parlours were replaced by living rooms. They often had wood panelling and sometimes built-in furniture, such as bay-window seats. 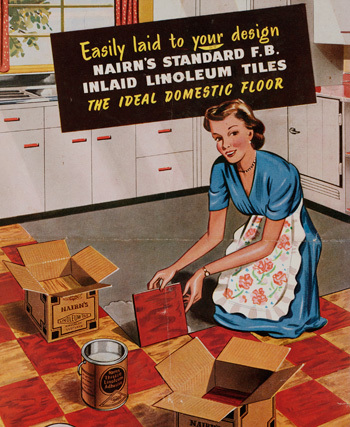 Kitchens and bathrooms often had linoleum floors and tiles to look clean and hygienic. Art deco style became popular in the 1930s. It was characterised by geometric patterns and bright colours. Materials such as chrome, Bakelite and plastics were used in furnishings. The modernist style emphasised functionality informality, with open-plan kitchen and living spaces. It reflected New Zealanders’ increasingly casual way of life. Social change was reflected in the interiors of people’s homes. For example, as more women entered the workforce there was more demand for labour-saving technology such as dishwashers and clothes dryers. Some people looked to the past for their inspiration. In the 1970s a ‘new colonial’ style became popular, while many people renovated older homes and furnished them in a period style. From the 1980s new styles such as postmodernism and Pacific cultures also influenced New Zealanders’ interior design. In the 2000s many homes blend modern technology and furniture with decorative objects from previous eras.